Banding together to fight homelessness. It’s the summer of 90’s rock. 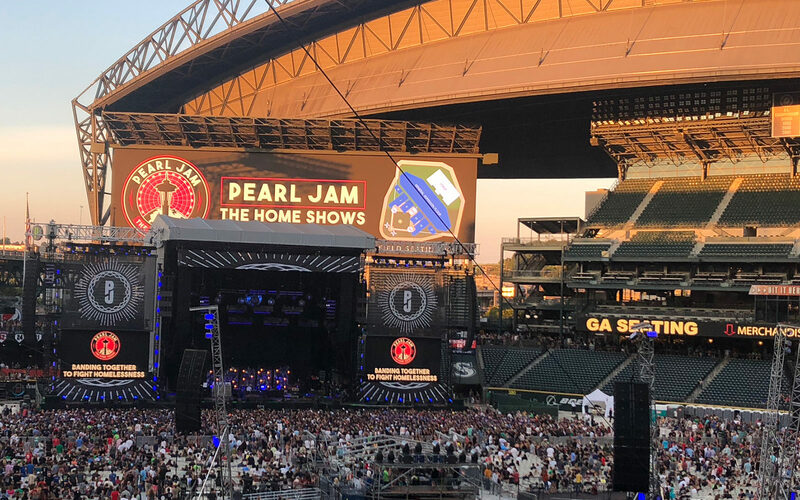 First up, Pearl Jam – the Home Shows. These tickets were tough to get, but I was lucky enough to score 2 for each show in Seattle. And most importantly, the shows benefit the homeless issue in Seattle. (See this article about the shows from the Seattle Times.) It’s so awesome that the band is doing this to shine a light on the cause. The first time I fell in love with PJ was 1992, when I was a freshman in college. The movie Singles was released right as I entered into UW, and my roommate and I were hooked. We must have listened to that soundtrack hundreds of times. :) Not only was that the soundtrack of my fall quater, PJ’s Ten album was heard from every frat house down greek row. I haven’t seen them since their last Seattle show, and so I was pretty excited to go and enjoy their music once again. The band did not disappoint. Three hours of music and community. It was an amazing night, with an incredible turnout.